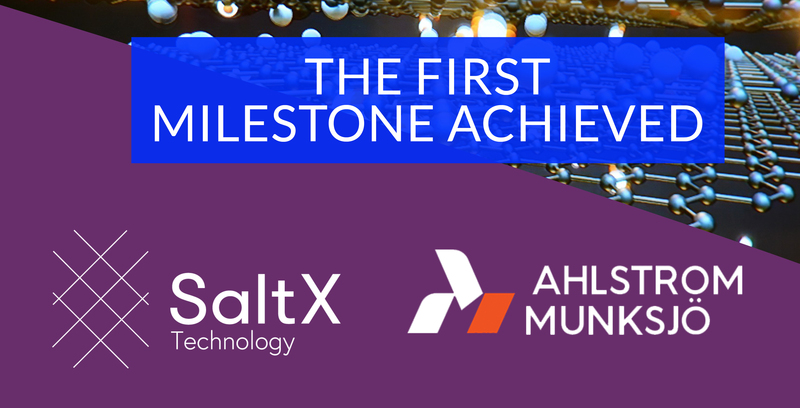 The energy storage company SaltX Technology (SALT: B) - listed on Nasdaq First North Premier - has passed the first milestone in the strategic development project together with Ahlstrom-Munksjö, a global manufacturer of fiber-based materials. Over the last six months, the companies have successfully been able to verify an industrial manufacturing method to coat graphene on paper and integrate it with SaltX patented nano-coated salt for its large-scale energy storage solution. The graphene manufacturer 2D fab participates in the project and delivers the graphene. The companies are now initiating production runs in Ahlstrom-Munksjö’s pilot line. In this strategic collaboration, which was initiated in March 2018, SaltX and Ahlstrom-Munksjö are developing and testing an industrial process for production of graphene-coated paper that is applied with nano-coated salt. The objective is to significantly reduce the production cost primarily of SaltX large scale energy storage solution but also the other applications. “Together with Ahlstrom-Munksjö we have now achieved the first important goal in the project: to show that the manufacturing concept works on an industrial level. We are impressed by Ahlstrom-Munksjö's innovative ability and creativity to find scalable and industrial production methods for our energy storage materials and look forward to taking the next step towards full-scale production" says Karl Bohman, CEO of SaltX Technology. ”Innovation and product development is vital for us in order to ensure growth and competitiveness through improving existing products and designing new ones. This project is one of our many on-going R&D-projects with the target of securing our ability to provide our customers with advanced custom-made fiber-based materials also in the future. We have now found and proved an industrially viable concept for this application by using our know-how and adjusting our existing production methods. There are still a few more steps until we can reach full-scale production, but this was a first important step. For the Insulation business, this is another exciting exploration of what we can do with fibers for our customers and the end users in the energy sector”, says Anna Bergquist, Vice President for business unit Insulation at Ahlstrom-Munksjö. At the end of last year, SaltX announced a strategic collaboration with a leading graphene manufacturer - 2D fab. The company is one of Europe's few manufacturers of the graphene that has the knowledge and capacity to produce the graphene on an industrial scale in a cost-effective manner. "I have a long experience in the paper industry from SCA, and when I heard about Göran Bolin's invention to cover graphene on paper, I immediately understood that it had great potential. We will be a leading supplier of graphene and will throughout next year significantly increase our manufacturing capacity" says Sven Forsberg, CEO 2D fab. Ahlstrom-Munksjö is a global leader in fiber-based materials, supplying innovative and sustainable solutions to its customers. The company’s mission is to expand the role of fiber-based solutions for sustainable everyday life. The offering includes filter materials, release liners, food and beverage processing materials, decor papers, abrasive and tape backings, electrotechnical paper, glass fiber materials, medical fiber materials and solutions for diagnostics as well as a range of specialty papers for industrial and consumer end-uses. Annual net sales is about EUR 3 billion and the company employs 8,000 people. Read more at www.ahlstrom-munksjo.com. 2D fab – www.2dfab.se - has a developed a unique energy efficient manufacturing process for 2D materials, primarily graphene. The company is a spin-off from the Mid Sweden University, and has its headquarters in Sundsvall, where also the development and upscaling of the production facility is located. In 2018, the company was voted by Ny Teknik and Affärsvärlden as one of Sweden's 33 hottest tech companies (the "33 list"). SaltX Technology has since several years developed methods to use graphene in its energy storage material. Graphene is a natural, coal-based material consisting of a very thin layer – merely one atom thick. The graphene increases the thermal conductivity of the SaltX material, resulting in a significant reduction of the production cost. SaltX Technology – www.saltxtechnology.com – develops and sells patented energy storage technology. Main customers are major global OEM partners and energy companies such as Alfa Laval, Vattenfall, Mobile Climate Control and Rheem. SaltX Technology's share is listed on Nasdaq Stockholm First North Premier. SaltX Technology’s Certified Adviser is FNCA Sweden AB.